Summer is in full swing, and you may be considering upgrading your outside entertainment area. 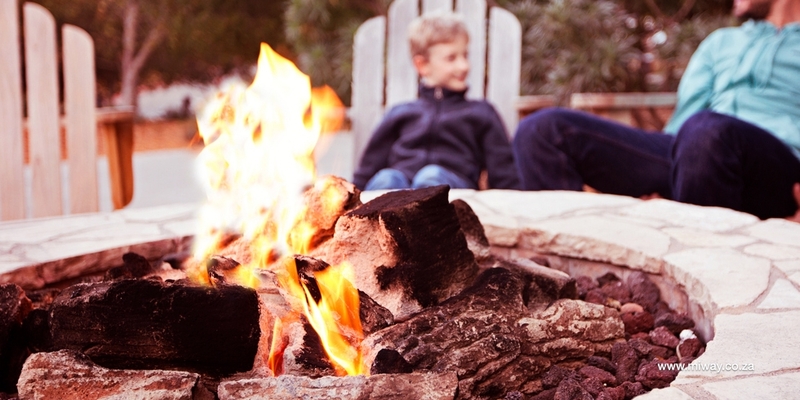 A backyard fire pit may be just the thing – and you can do it yourself! Location, location, location! Choose a suitable position, keeping in mind that it is a fire hazard! A good rule of thumb would be to locate the fire pit at least three metres from any other buildings, but do check out any local regulations. Nearby trees with low-hanging branches that may catch alight are also something to keep in mind. How will it be constructed? The fireplace itself should be made of something that can withstand heat – using the bottom of a 44-gallon drum is a good option and can easily be sunk into the ground. Alternatively, if you have some knowledge of working with the material, you could cast the mould for the pit out of concrete. Whatever you choose, it’s a good idea to make sure that rainwater can drain out of the cavity. Time to pave! The pavers surrounding the fire should also be able to handle the heat of the fire. Most concrete products will be safe to use; if looking at tiles or other materials, make sure these will not splinter or crack because of the heat. What’s underfoot? Before you lay your pavers, level the area and remove all weeds and grass. Consider laying down a sheet of plastic to discourage weeds and grass from growing there again, and then put down a 10cm-deep layer of sand. The sand should be compacted and levelled before setting the pavers in place. Feeling beachy. You could even stop at the sand; it feels good underfoot and with an enclosure, can create a lovely sitting area for hanging out around the flames. Add your own touch. Make sure your fire pit fits in with your lifestyle - add cladding, elegant benches or neat decking to the area surrounding the fire … or keep it rustic with simple log seats for guests to sit on. Live your way by hosting your friends effortlessly and in style! Adding a fire pit to your yard could increase the value of your house, so your home insurance policy may need to be adjusted. It is wise to speak to your insurer or get an insurance quote from MiWay today!